Can you make lightening strike twice? Click here to play! If you can manage to harness the power of this energy, you'll see yourself winning a whole lot of money! Like many traditional slots, this 3 reel game depends on the winning power of Lucky Sevens. 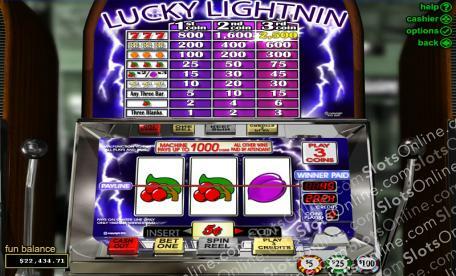 Spin the reels and get the lightening to strike three sevens across the pay line and you'll be rewarded up to 2500 coins! Of course Double and Single bars are here too. The previous pays out up to 600 coins and the latter comes in at up to 30 coins. Three Oranges across the pay line will get you up to 300 coins. Watch out for lightening to strike cherries, plums and blanks for more chances to win. Here's one example of when you want lightening to strike! If you can harness the power of this electric game, you'll see yourself coming into a pretty large fortune.